I am in the lounge of Chamounix Mansion, Philadelphia. Today I went to the Metropolitan Museum of Art, New York. That was so huge that I could not see every room in there. There are plenty of works of Paul Klee, Stewart Davis, Henri Rousseau, Giorgio de Chirico, Jasper Jones, Andy Warhol, Chuck Close, James Rosenquist, etc. The glass work section was so fantastic, because I have never seen that kind of arts before. The reflections between two or more phases of different glasses were very interesting. I got tired sooner than usual, because the bed in the hostel was too hard to feel comfortable and to sleep well. There was a trouble before arriving at Chamounix Mansion. The taxi driver did not know exactly where the hostel was. We were moving around this, Fairmount Park. Finally we went supermarket and made a phone call to the hostel. At the supermarket, we met a old woman who was asked the direction by the taxi driver on the way! She concerned whether the charge meter was running or not. I confirmed the meter had already stopped. How kind she was! Then finally we get the hostel, and I said "Thank you for traveling." He smiled. I think he was good man except for the lack of knowledge about places. When I entered, the worker asked me how much it costed by the taxi. I said, "15 dollars." He said, "That was fair enough. Some drivers ask more expensive fare." In the morning, I went to Denny's to have a breakfast with a man who was from 2 hours away by car, and woman who was from Germany. She is studying Chemistry as a Doctor. He is a social worker in a hospital, and was just enjoying a weekend. They speaks English very well. So I wished I could have spoken well. Fortunately, they each have cars. I could ride on her car to the Philadelphia Museum of Art. We split at the entrance and started looking. There are many works of Marcer Duchamp. Those were interesting for me. I think the Museum here is much smaller than the Metropolitan Museum. We can see everything in a day. 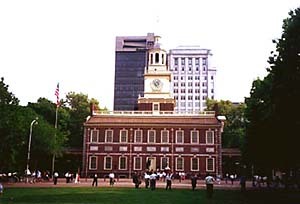 Then I visited National Historical Park Philadelphia. But I gave up seeing early, because it was too late to join a guided tour. And another reason was that it was too hot today. I would not imagine it when I was in Chicago. I am in the lounge of Washington International Youth Hostel. Before leaving the hostel of Philadelphia, I had a chance to have a breakfast with old American people. There were a woman looked almost the same age as my mother, and her parents. They live in Ohio. They said that their country is almost flat, and they don't have many mountains. They have a lot of farms. While we were talking about languages, the woman's father said, "European people usually learn English as a second language, and most of them can speak English well. But we American cannot always speak other languages. That is bad point of us." The words impressed me very much. I said, "Japanese have usually problems with learning English or some other languages, because the language Japanese is completely different from Western languages. " Before we parted, they gave me their phone number and said "Feel free to visit our country and to stay our house." It was very nice meeting them there. At 4:00pm, I finally arrived at Union Station, Washington D.C. Then I looked around the station's mall, and went to the hostel. At 6:00pm, I walked around the White House and spent about an hour in the park near the White House. I practiced some rhythms with mallets a little. Then I had a meal at China Town.